Yeah, it’s kinda like that. Some ways back, I dove into Owen K.C. 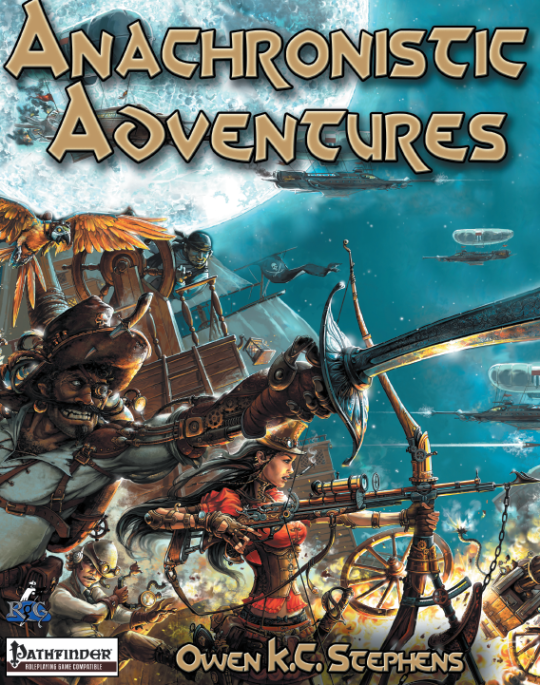 Stephen’s Anachronistic Adventures line for Rogue Genius Games. All in all, a satisfying method of importing pulp-style heroes in a fantasy world. However, the classes as written lent themselves to a “strangers in a strange land” kind of game. If you wanted a “A Connecticut Yankee In King Arthur’s Court”, the books were just for you. While the rules basis is made for pulpy heroes, you can easily modify the rules to fit this day and age. Back then, this line of books was teased as a pulpy supplement to make your PF games more modern. Or at the very least, you could play as Ash Williams from Evil Dead/Army of Darkness! However, the creator himself admitted that the game relied on core PF rules and needed more to be its own setting and world. Thus, over the next couple years following release, mini playtests and other bits were released and the final version was originally brought to the public via a large bundle pack. However, it wasn’t till several updates cropped up till the content was more suited for its own independent game. A couple of weeks ago, the revised book was released in a bundle pack for the observant and lucky few to dive into. Fortunately, the book was later released in online stores like RPGNow for all to purchase. So, with fresh eyes and a better understanding of pathfinder, how does this updated book hold up? Especially considering it’s made with games independent of Paizo’s fantasy setting in mind, does it hold up on its own? Let’s roll some dice and find out!